In physics, the Lamb shift, named after Willis Lamb, is a difference in energy between two energy levels 2S1/2 and 2P1/2 (in term symbol notation) of the hydrogen atom which was not predicted by the Dirac equation, according to which these states should have the same energy. Interaction between vacuum energy fluctuations and the hydrogen electron in these different orbitals is the cause of the Lamb shift, as was shown subsequent to its discovery. The Lamb shift has since played a significant role through vacuum energy fluctuations in theoretical prediction of Hawking radiation from black holes. 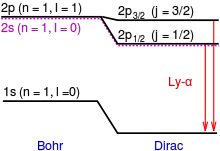 This effect was first measured in 1947 in the Lamb–Retherford experiment on the hydrogen microwave spectrum and this measurement provided the stimulus for renormalization theory to handle the divergences. It was the harbinger of modern quantum electrodynamics developed by Julian Schwinger, Richard Feynman, Ernst Stueckelberg, Sin-Itiro Tomonaga and Freeman Dyson. Lamb won the Nobel Prize in Physics in 1955 for his discoveries related to the Lamb shift. On Lamb's 65th birthday, Freeman Dyson addressed him as follows: "Those years, when the Lamb shift was the central theme of physics, were golden years for all the physicists of my generation. You were the first to see that this tiny shift, so elusive and hard to measure, would clarify our thinking about particles and fields." This heuristic derivation of the electrodynamic level shift following Welton is from Quantum Optics.
. The electron is unable to respond to the fluctuating field if the fluctuations are smaller than the natural orbital frequency in the atom.
. Therefore, one can choose the upper and lower limit of the integral and these limits make the result converge. is the fine-structure constant. This shift is about 1 GHz, very similar with the observed energy shift. In 1947 Willis Lamb and Robert Retherford carried out an experiment using microwave techniques to stimulate radio-frequency transitions between 2S1/2 and 2P1/2 levels of hydrogen. By using lower frequencies than for optical transitions the Doppler broadening could be neglected (Doppler broadening is proportional to the frequency). The energy difference Lamb and Retherford found was a rise of about 1000 MHz of the 2S1/2 level above the 2P1/2 level. This particular difference is a one-loop effect of quantum electrodynamics, and can be interpreted as the influence of virtual photons that have been emitted and re-absorbed by the atom. In quantum electrodynamics the electromagnetic field is quantized and, like the harmonic oscillator in quantum mechanics, its lowest state is not zero. Thus, there exist small zero-point oscillations that cause the electron to execute rapid oscillatory motions. The electron is "smeared out" and each radius value is changed from r to r + δr (a small but finite perturbation). with k(n,ℓ) a small number (< 0.05). In 1947, Hans Bethe was the first to explain the Lamb shift in the hydrogen spectrum, and he thus laid the foundation for the modern development of quantum electrodynamics. Bethe was able to derive the Lamb shift by implementing the idea of mass renormalization, which allowed him to calculate the observed energy shift as the difference between the shift of a bound electron and the shift of a free electron. The Lamb shift currently provides a measurement of the fine-structure constant α to better than one part in a million, allowing a precision test of quantum electrodynamics. A different perspective relates Zitterbewegung to the Lamb shift. ^ G Aruldhas (2009). "§15.15 Lamb Shift". Quantum Mechanics (2nd ed.). Prentice-Hall of India Pvt. Ltd. p. 404. ISBN 81-203-3635-6. ^ "Willis E. Lamb, Jr. 1913—2008" (PDF). Biographical Memoirs of the National Academy of Sciences: 6. 2009. ^ Marlan Orvil Scully; Muhammad Suhail Zubairy (1997). Quantum Optics. Cambridge UK: Cambridge University Press. pp. 13–16. ISBN 0-521-43595-1. ^ Lamb, Willis E.; Retherford, Robert C. (1947). "Fine Structure of the Hydrogen Atom by a Microwave Method". Physical Review. 72 (3): 241–243. Bibcode:1947PhRv...72..241L. doi:10.1103/PhysRev.72.241. ^ Bethe, H.A. ; Salpeter, E.E. (1957). Quantum Mechanics of One- and Two-Electron Atoms. Springer. p. 103. ^ Bethe, H. A. (1947). "The Electromagnetic Shift of Energy Levels". Phys. Rev. 72 (4): 339–341. Bibcode:1947PhRv...72..339B. doi:10.1103/PhysRev.72.339. ^ Henning Genz (2002). Nothingness: the science of empty space. Reading MA: Oxford: Perseus. p. 245 ff. ISBN 0-7382-0610-5. Boris M Smirnov (2003). Physics of atoms and ions. New York: Springer. pp. 39–41. ISBN 0-387-95550-X. Marlan Orvil Scully & Muhammad Suhail Zubairy (1997). Quantum optics. Cambridge UK: Cambridge University Press. pp. 13–16. ISBN 0-521-43595-1.